Claudia Pearson's design celebrates the trappings of tea, from Darjeeling tins to sencha pots. Elegant matcha whisks and antique tins of aromatic Darjeeling—for tea devotees, the actual dried leaves steeped in hot water are only part of the experience. Dry your dishes or blot teatime drips with Claudia Pearson's design celebrating the accoutrements of the world-renowned beverage. 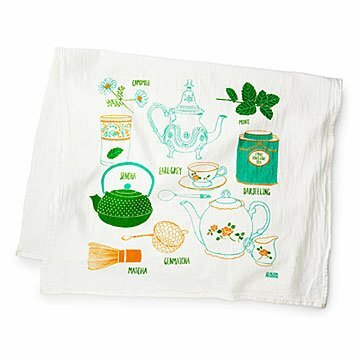 From camomile flowers to iron sencha pots, it illustrates these trappings in classic tea towel (or should it be tea tea towel?) fashion. The generously sized cotton design makes a great gift for anyone who loves the ritual of a good cup of tea. Handmade in Michigan. Wash warm and hang to dry.